I definitely don’t think prices are going to fall 40%. No way. But where do I see prices going? I lay out my thinking here. 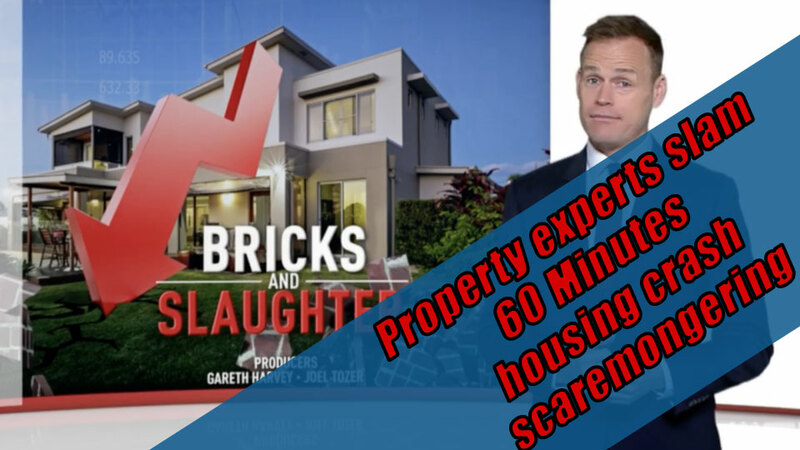 Everyone has been quick to ridicule 60 Minutes and their episode last week about Australia’s coming “house price crash”. And fair enough. You do hear people make these outrageous calls from time to time and it’s worth calling BS when you hear it. But to be honest about it, I think you also need to say where you think prices will actually go instead. I think you also have to acknowledge what is actually happening – prices in several cites are already falling. But I’m not hearing a lot about that. So I thought I would flesh out where I actually think prices are going to go from here. So first thing first, yes, the 60 Minutes episode (called Bricks and Slaughter!!!) was sensationalist rubbish. No one is really arguing the toss there. The two respected experts they interviewed (SQM’s Louis Christopher, and Digital Finance Analytic’s Dr Martin North), have both come out and said that 60 Minutes edited their comments and took them out of context. Yes, prices could fall 40%, but it was by no means their central scenario. The other point I’d make is one that former RBA Glenn Steven’s used to make. House prices tend to ratchet up. That is they rise for a while, then they flatline or drift lower. Then they rise again, and repeat. You very rarely seen substantial falls in the market, because property is like that. It’s big and it’s chunky. If you don’t have to sell for a loss, then you generally don’t. That being the case, major price falls tend to only happen in ‘disasters’. That’s probably too strong a word for it – but major shifts in the market. We’re talking recessions, or a global shock, or a sudden rise in interest rates. In these scenarios people can be forced to sell (e.g. you lose your job and can no longer afford your mortgage payments.) When that happens en masse, then yes, you can see substantial price falls materialise. Anyway, if that ratcheting effect is true, and I think it is, then if you’re going to argue that prices are going to fall 40% or something like that, then you have to be arguing that something disastrous is going to happen. Now I don’t see that happening and I don’t actually see any economist in the market who see it happening either. The Australian economy is chugging along fairly well. Jobs growth is strong and there’s early signs of strength in wages. Interest rates certainly aren’t going anywhere. Maybe there’s some sort of black swan event on the global stage – that could always happen, but it’s so random it’s hard to plan for. Anyway, long story short – I don’t see any disasters on the horizon, and in the absence of that, it’s very hard to see major price falls becoming a reality any time soon. But prices are falling. Across the country, prices are already down 2% – that’s maybe not much to write home about, but momentum is clearly moving lower. The point I would make here is that recent prices falls are entirely ‘artificial’. That is, they have been brought about by regulatory intervention in the market. APRA – the bank regulator – has ben coming down hard on the banks and getting them to tighten up their lending practices. That has made it tougher to get a loan, has meant that we’re not able to borrow as much as we were, and we’re having to pay a higher rate for the privilege. So these softer conditions were always going to happen. But what I would say is that APRA (and their political masters) will be incredibly careful not to crash the market (no one wants that on their resume!). So they’ll be taking it slowly, slowly, and measuring the impacts at each step of the way. And if it looks like anything like a 40% crash is going to happen, you can be very sure they’ll change their tune. So really the only question is how far do regulators want the decline to run? The regulators aren’t too worried about prices per se, they’re more worried about the quality of the finance sector’s loan book. And so they’ll keep going until that’s tidied up. That’s more a question of ‘how long?’ than ‘how low?’ My guess, without having access to the banking data they do, is that I expect conditions to remain tight for at least another year, maybe 18 months. So in that time, I would then expect prices to drift lower as banks sort themselves out. But not at a quick pace. It will be slowly, slowly. And so I expect that from -2% now, we’ll get to -5%, possibly -8%… -10% at the outside. If that sounds bad, remember, that’s where the market started in 2017! It’s not a calamity. And so for investors, I’d say don’t worry too much about prices. I think we’ll be ok (and APRA will probably make sure of that). Rather, I’d be worried about how these APRA restrictions will impact you. Are the banks going to start knocking you back or requiring you to front more equity? Are you going to pay a higher interest rate? Are you going to be able to get finance at all? Right now, these are much bigger and more important questions. But 60 Minutes is setting the agenda, so what are you going to do?